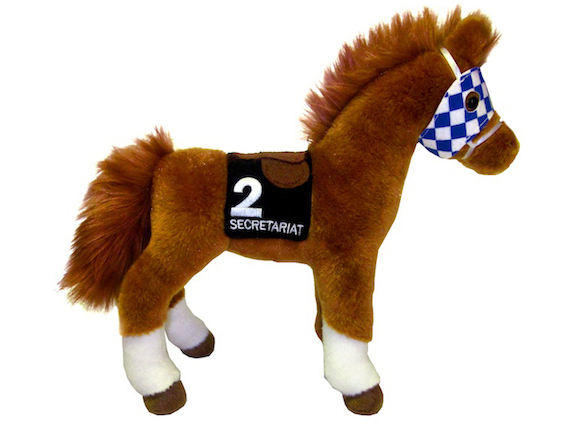 We are proud to offer the cutest addition to the Secretariat Collectible Stable. Fittingly, the second edition release of an official Secretariat plushie features the Meadow Stable champ bedecked in the famous number "2" saddlecloth he carried in his record-breaking victory in the 1973 Belmont Stakes. This historical triumph provided the exclamation point for Secretariat's successful assault of horse racing's most coveted accomplishment - the Triple Crown. This new cuddly edition of “Big Red” features the distinctive details that make Secretariat one of the world's most recognized and beloved horses of all time. From the famous blue and white blinkers representing the colors of the Meadow Racing Stable to the three white sock markings on his legs, the adorable plush proudly continues to enhance the Secretariat legacy and usher in a whole new generation of adoring fans. Substantially larger than our previous Secretariat plush edition, this Collectors Plushie stands 10" tall and comes with its own authentic hang-tag designating it an officially licensed product. As a tempting treat for Super-Fans of the Super-Horse, the Secretariat Collectors Plushie is available with the option of being hand-signed by the Hall of Fame jockey Ron Turcotte. For yourself, your kids, or your favorite Secretariat fan, this irresistible keepsake fits the bill, order now!